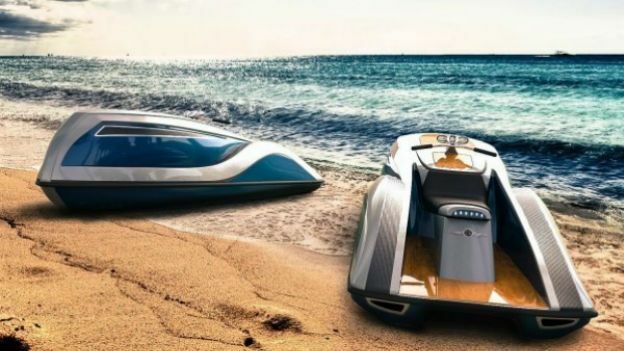 A new luxury personal watercraft has been outed by yacht designer Kurt Strand and planned for a commercial release later this year. Boat designer Kurt Strand has been hard at work coming up with a new luxury jet ski-type craft that'll let you one-up Tarquin next time you're down the yacht club. The fantastically rude-sounding V8 Wet Rod is a personal watercraft featuring a 16-foot carbon fibre body and a 300-hp 5.7-litre V8 engine. Top speed is a reported 65mph and there are plenty of optional extras for the seafaring millionaire with cash to spend. These include wood or carbon fibre inlays, custom paint, a chrome engine dress-up kit, sound system and GPS navigation. Wouldn't want to get lost on the way to Monaco, after all. And drinks can be stored in the ice box under the seat. Naturally. Strand's company Strand Craft says the Wet Rod will be commercially available later this year with prices starting at $49,000, which is roughly £28,500. The company is also working on a $25 million Strand Craft 122 super yacht that comes with an on-board supercar. Just in case you're in the market.